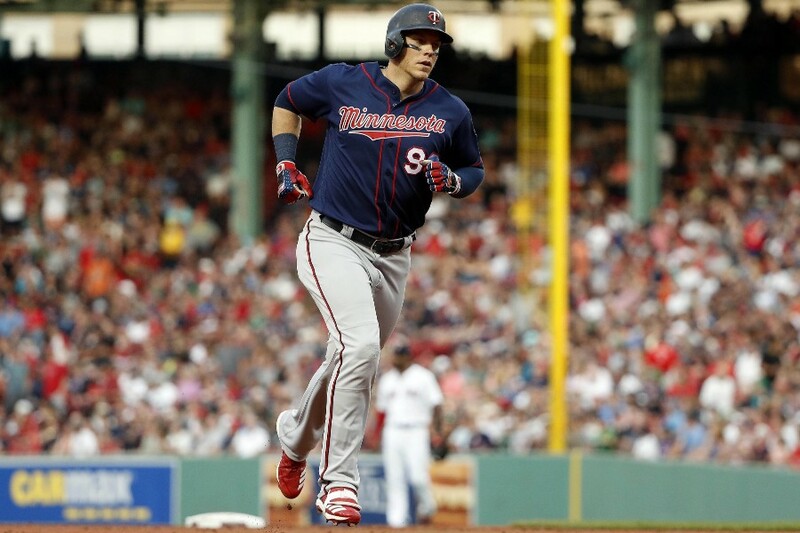 Twins DH/1B Logan Morrison was recently shut down for the remainder of the season and, by reports, is expected to undergo surgery for a hip condition that has been bothering him for much of the year. The problem is being reported as ‘hip impingement’, which is a fairly common diagnosis. Some may recall that the NBA’s Isaiah Thomas dealt with this problem over the past couple seasons and underwent surgery more recently. Question 1: What is hip impingement? Hip impingement is another term for what orthopedists call ‘femoroacetabular impingement’ or FAI. This term basically means pinching of the hip labrum tissue between the bone of the ball and the bone of the socket of the hip. The hip is a ball and socket joint. Around the rim of the socket is a tissue called ‘labrum’ which acts as a cushion, and also seals the ball into the socket. In an ideal world, the ball is perfectly round and the socket is perfectly hemispherical. In this case, when people move the hip around, there is no pinching. However, in some people, rather than being round the ball is more shaped like a grape or an egg. In these cases the extra bone can cause a pinching of the labrum when the hip is flexed (for example, when seated). Over time, this repetitive minor injury can cause damage to the labrum. There can also be extra bone on the socket side, which can have a similar effect. These two situations are called CAM impingement (extra bone on the ball) and PINCER impingement (extra bone on the socket). In many cases, both CAM and PINCER impingement coexist. Question 2: I don’t remember LoMo getting hurt. When did the labrum get torn? Typically, this is not an injury that results from a single incident (though it can happen that way). It is much more common for this to be the result of an accumulation of ‘microtraumas’ over a long period of time. In addition, the CAM and PINCER deformities are quite common in people who don’t have any pain in their hips. In some studies, >50% of asymptomatic patients have some signs of CAM or PINCER deformity on hip xrays. Simply having the ‘extra bone’ doesn’t automatically mean it is going to be a problem. Our understanding of why people develop these deformities is improving, but we don’t know the cause at this time. It appears to be more common in people participating in athletics (particularly hockey), so we think it has something to do with low-level trauma to the area during growth years. Question 3: Does a labrum tear always need surgery? No. 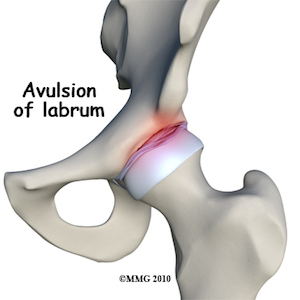 A labrum tear is also a very common finding in patients with no hip pain. In one study of patients between 18-40 years old who had no hip pain, MRI’s of the hip showed a labrum tear about 40% of the time. So clearly not every labrum tear causes pain or requires surgery. There are also a number of conditions that can cause similar pain to hip impingement (ranging from hernias to pinched nerves in the spine to ‘sports hernias’ and many others). Therefore, time is often spent trying to decipher what the actual cause of the pain is in these patients, as it isn’t always as straightforward as we would like it to be. Question 4: How do we tell which labrum tears need surgery and which do not? This can be difficult, but typically rest, anti inflammatory medication, physical therapy and/or injections of cortisone are tried prior to surgery. Many patients can find success with these treatments. However, some do not, and surgery may be warranted. Question 5: What is done during surgery? There has been a significant evolution of techniques in hip surgery over the past decade as surgery for this condition has become more common. It can be done either open (through an incision) or arthroscopically (through the scope). Arthroscopic treatment is much more common, particularly in the United States. The hip is stretched apart by use of a special table that pulls the joint open about 1cm. The scope is put in to the joint and tools are used to examine the joint space. We look at the surface cartilage, labrum and other structures in and around the hip. Once we have looked at everything, any ‘extra’ bone on the socket side is carefully removed with a tool called a burr. The labrum tear is often repaired with small anchors back to the rim of the socket (from where it tore away). The ball is then released back into the socket and we use the burr to reshape the ball, removing extra bone in that area as well. Surgery often takes 2-4 hours depending on the extent of injury. Question 6: How long is the recovery? As with any surgery, the recovery is variable, but most high-level athletes are back to full sports around 6-8 months after the operation. There have been several studies examining the performance of professional athletes in different sports after return from this hip surgery. Most have shown little or no diminished performance after recovery. I’m certain even Morrison would say he didn’t have the season he was hoping to have for the Twins, and this hip issue certainly could’ve been part of the reason. Hopefully he can improve after surgery and get back to his 2017 form, whether for the Twins or elsewhere. Thank you, Heezy. It's always interesting to read information presented by a true expert as opposed to the inexpert guesses that we often see on sites such as this. So what did the team know and when did they know it? May just as well DL'd him for the entire year. Go back to Question 2 in the article. Teams don't usually release a daily diary for players' visits to the trainer's room. I think there's no reason to take an uncharitable view of the team's handling of LoMo's situation. I apologize you didn't find the post helpful. The intent is not really to do a deep dive into LoMo specifically. I'm not privy to the details of his case (and even if I was, not at liberty to share due to privacy reasons). My hope for this post (and other similar ones I have done) is to provide some basic background information on a particular condition/injury that a Twin is dealing with. Medical jargon can be confusing, and there are many misconceptions that exist. As to your comment, I'm certain he knew he had pain. The more complicated question would be, "Is the hip the cause of the pain." It often is. However, just as often, it is something else, even with findings on MRI, X-rays, etc. Medicine is funny that way. If your intent was to provide "basic information", you've overdone yourself. If it has been the responsibility of the front office, medical staff, MOY or Morrison himself to determine if he was injured and that hampered his performance seriously, then they were all asleep at the switch for sending him out there day after day or were flagrantly ignoring it. Unlikely as it sounds, they would have been better off running out Grossman. I think the more likely scenario is that they realized early on that the hip was an issue. Some people are able to play through this problem and compete at a high level. If he were to have surgery, whether in April or August, his season is over. So I can understand the trial to attempt to play through the pain. Now, whether the decision could or should have been made earlier is difficult to know without knowing the specifics. But I have been involved in enough of these situations (though not necessarily professional athletes), that I know the decision is rarely clear-cut. Logan is a competitor. I suspect he really wanted to compete and try to help the team win. Morrison made the decision, to give it a go and Morrison made the decision when to shut it down to get himself ready for next year. I'm sure the medical staff was in the room and part of the discussions, I'm sure there were a lot of opinions but at the end of the day... Morrison was willing to tough it out so he was allowed to tough it out. It was probably very difficult for the medical staff with specifics to make recommendations on shutting him down earlier especially if Morrison is saying his pain is a 3 when he should be saying 7. I can see how this is a hard decision, IF... IF Morrison performed to a level that made it hard. Morrison did not play to that level. At some point much earlier, they needed to take the awareness of the injury, the variance of pain and pain tolerance, the opinions of the medical, the players competitiveness. Considered it all... And then looked at the actual production and said... "Shut him down". I believe Morrison shut himself down, for his benefit and it was too late for us when he finally did. I'm making assumptions though. Either way... if healthy he should have been slowed down... if injured he should have been shut down. His performance was not major league quality. Way too much playing time in consideration of everything. If Morrison and/or his agent KNEW Something was wrong with his health (his hip) at the time the contract was signed, then they were not negotiating in good faith and were not fully disclosing Morrison's physical condition to the Twins organization. If that is the case, there should be some Legal ramifications the Team could take against the player and his representation to recover some of the financial considerations of the contract. Or perhaps the 2nd year option fee could be ELIMINATED. Waiting Game to Play Out Differently in Minnesota?